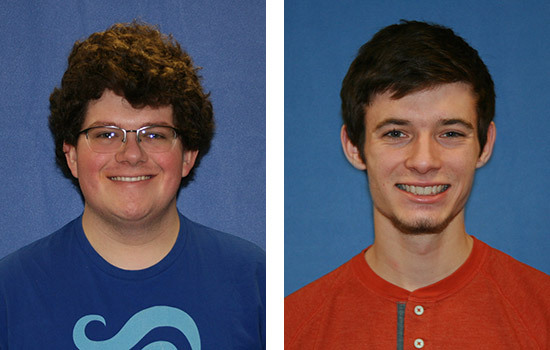 Two undergraduate chemistry students at Rochester Institute of Technology have won honorable mention awards from the Barry M. Goldwater Scholarship and Excellence in Education Program. Benjamin Catalano, from Irwin, Pa., and Ryan LeTourneau, from Bowie, Md., were recognized based on academic merit. This year, the Goldwater Foundation selected 240 scholars and 307 honorable mentions from 1,286 nominees from 2,000 U.S. colleges and universities. Catalano and LeTourneau are fourth-year students in RIT’s School of Chemistry and Materials Science. Catalano conducts nanomaterials spectroscopy research with John David Rocha, assistant professor in RIT’s School of Chemistry and Materials Science. Catalano analyzes possible viable structures for boron and carbon nanomaterials using computational modeling and studying Gaussian and boron nanomaterial reaction pathways. He has participated in a National Science Foundation-funded Research Experience for Undergraduates programs at the University of Michigan in the Kotav Center for Photonic and Multiscale Nanomaterials. He presented his research findings at the University of Michigan and at RIT summer undergraduate research symposia. Catalano is a member of the RIT Chemistry Research Scholars, the RIT Honors Program and RIT Concert Band and a past recipient of the First Year Achievement Award in Chemistry. He plans to pursue a Ph.D. in computational chemistry. LeTourneau works in research professor Hans Schmitthenner’s laboratory in RIT’s School of Chemistry and Materials Science. LeTourneau conducts research on the creation of targeted molecular imaging agents for photoacoustic and optical imaging of cancer cells. This research was a runner up in the RIT Tiger Tank competition. LeTourneau has conducted research at the Memorial Sloan Kettering Cancer Center in the Grimm Imaging Lab on Rare Earth Oxide Containing Nanoparticles for Advanced Optical Imaging, and a patent disclosure has been submitted for this work. LeTourneau has presented his research at the World Molecular Imaging Congress; the Rochester American Chemical Society Undergraduate Research Symposium, where he won best organic poster award; and the Rochester Academy of Sciences. He is a member of the RIT Chemistry Research Scholars and the RIT Honors Program and is a recipient of the Shaps Scholars Award for Excellence in the Gerstner Summer Undergraduate Research Program. LeTourneau plans to pursue his Ph.D. in chemistry.